Wow… What a difference a few days make! Our water temps have really seen some increases within the past few days with our Backwater temps reaching 72, Intracoastal Waterway at 68 and the Surf at 62! With the waters going up… the Fishing has really heated up! 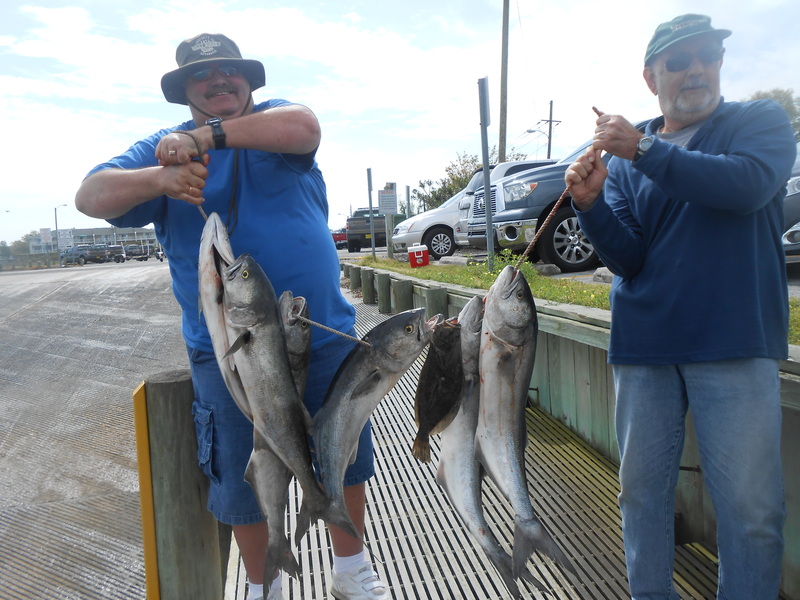 What did we catch… F. Albacore, Monster Blue Fish (some 10+ pounds), Black Seabass, Porgy’s, Speckled Trout, Flounder & Red Drum all on Light Tackle! 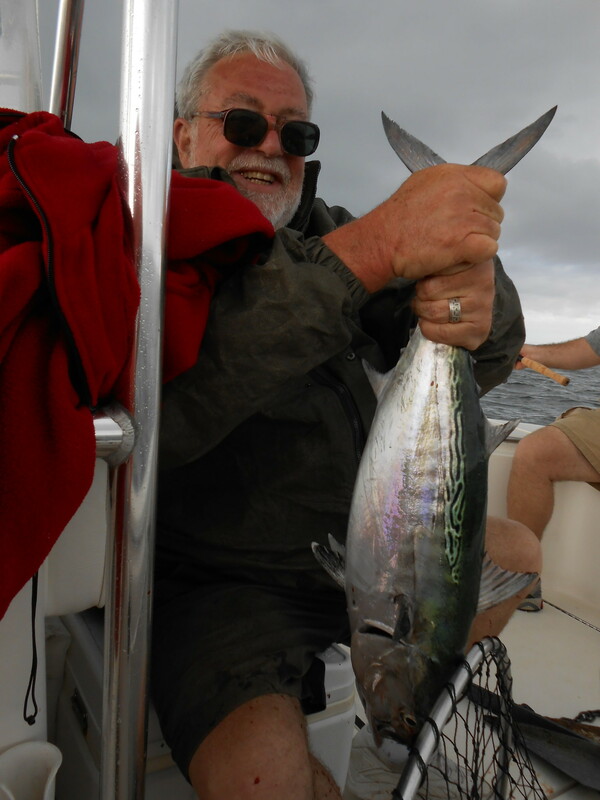 On the morning of 4/18 we pushed offshore to scout a near-shore wreck in search of the elusive Bonito & F. Albacore. The seas were 3ft every 6 seconds or so with the wind steady out of the South (10 – 15 kts). With the bow pointed Northeast and 25 minutes later we arrived and started searching for Birds Diving and the Top-Water explosions these Tuna are famous for. I let the guys know that we were merely “scouting” and that if successful, we would have the First report of a Bonito in the nearshore waters of Wrightsville Beach (within 10 miles) as the day before the Bonito were still about 13 miles off the coast (reportedly mixed in with 30lb schoolie BFT I might add J). We decided to drop some baits down on the Wreck all while continuing to search for birds and tuna on top. After catching a few Black Sea Bass and Porgy’s, (and no sign of Mr. Bonito) I decided to push back in closer to the beach to chase some bluefish and see if we could find a Tuna in the warmer inlet waters right inside of the Jetty. I hit many usual spots inside the Jetty as catching numerous bluefish when the top water explosion happened… TUNA WAY INSIDE THE WRIGHTSVILLE BEACH JETTY! I quickly pulled anchor and jammed the throttle toward the Tuna (I could not tell from the distance we were at if they were F. Albacore or Bonito. With one perfectly placed cast and a small prayer… it was FISH ON! After a 20 minute battle on 15lb test, we managed to get the Albacore to the boat! This to my knowledge is the First F. Albacore Tuna caught inside of the Wrightsville Beach Jetty this year! As usual after a fight like that, there were High-Fives all around, a photo session and a quick release back to fight another day! Just as quickly as the Tuna showed up… they were GONE… as to be expected for such an early and unusual showing of Albacore that were that far inside the Wrightsville Beach Jetty. 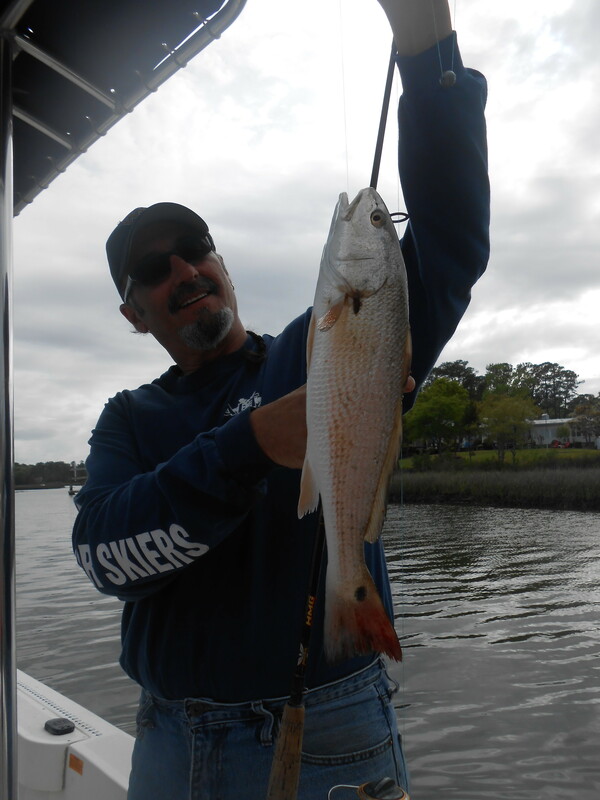 Afternoon of 4/18 we pushed North to the Backwaters via the ICW and headed toward Figure Eight Island and South Topsail in search of Redfish, Drum, Trout, Flounder & Monster Chopper Bluefish. We managed all of the above in short order and with LOTS of excitement! There is no better feeling than Guiding someone in the Salt for their first Saltwater Fishing experience and landing a Grand Slam including 10lb Chopper Blues! We caught a the Trout on a Blue Water Candy ½ oz Pink jighead with a grey pepper flaked Berkley Gulp and the Drum on Fresh Fresh Fresh Locally caught shrimp. The Drum are still feeding in their winter schooling patterns (more foraging than “hunting”, this is why FRESH Shrimp is KEY right now to pick up the Red Drum. This will all change in a week or so as the waters warm, the redfish disperse from the winter patters and start aggressively feeding on the baitfish. We used Nate’s Bait Cured Mullet for the Choppers on 20# wire to a 1oz egg weight Carolina Rigged… In NO TIME the “Train Wreck” Happened. The rod penned in the gunnel with the drag Screaming off the reel… In my opinion, there is nothing more exciting in the backwater than fighting and finessing a Monster Fish! Once the Chopper Blues hit, its coaching and fighting for the next 10 minutes (all while keeping the fish out of the Dock Pilings and oyster bars) followed by more High-Fives!!! The morning of 4/19 we pushed North from Wrightsville Beach to “re-unite” with the Chopper Blues again. WOW were they in! In short order, we managed 10 Huge Choppers (releasing several and keeping a few) in the backwater and one 17” Flounder! Just as the day before, the Bluefish came on the Nate’s Bait Brined Mullet and the Flattie on a BWC Jighead with a Pearl colored Berkeley Gulp. As the rain moved in and the wind picked up we headed to the hill with lots of smiles and stories! After two days with the Fishing Gear (see below) taking a beating on BIG FISH, we only managed to break one guide of a rod when the rod was PINNED to the gunnel with a monster on the other end… I consider that a WIN! As Always, Tight Lines & Hope to see You on the water! 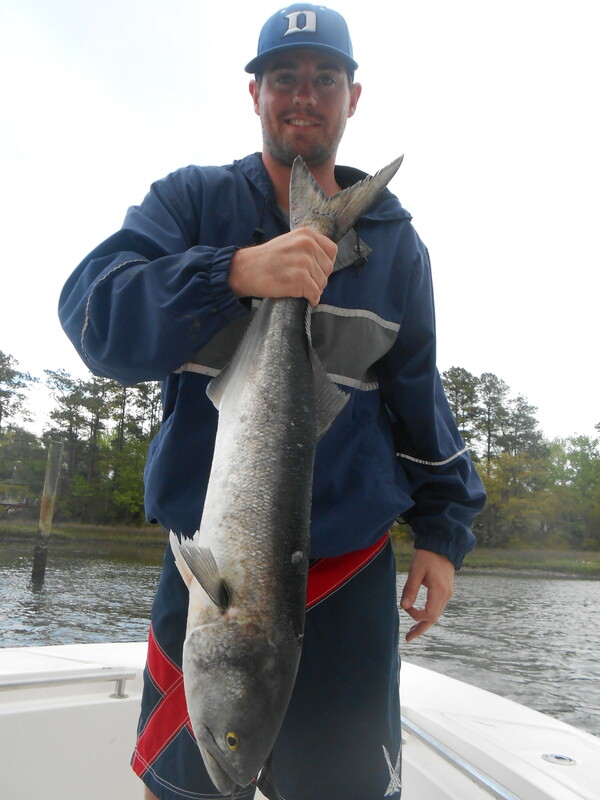 This entry was posted in Fishing Reports, ProFishNC News and tagged NC Fishing Charters, Wrightsville Beach on April 20, 2013 by admin.